Well, guess what? It's that time of the year again! The holiday season is in its full swing, and this is the time during which a majority of businesses are looking forward to increasing their sales. This includes businesses from different industry verticals and the Web, as well as mobile app development companies, which fall under the same category. 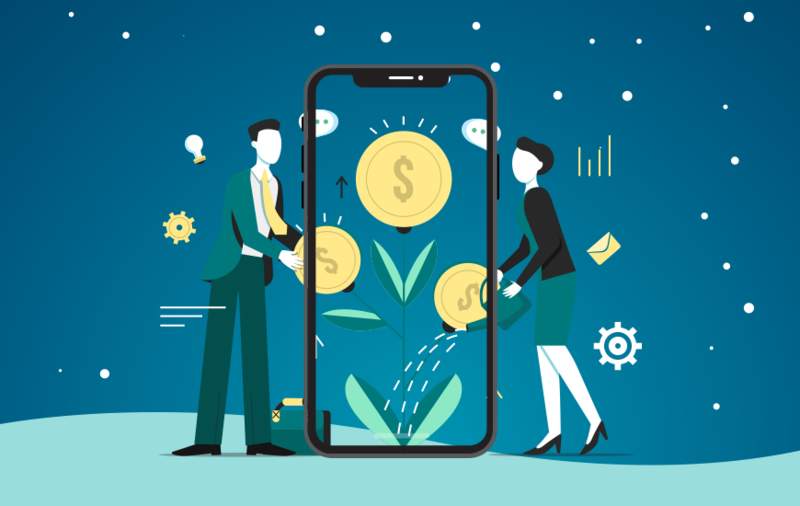 So, our team at MobileAppDaily decided to help app owners out by providing them with information on 'How you can maximize your app revenue' with this article. Keep on reading to know the efficient ways that can help you in maximizing your app revenue this holiday season. But before we get straight to the main part of the article, let’s take a look at some statistics. According to a report released by Statista, statistics show that sales tend to rise from 10 to 20 percent during the holiday season. 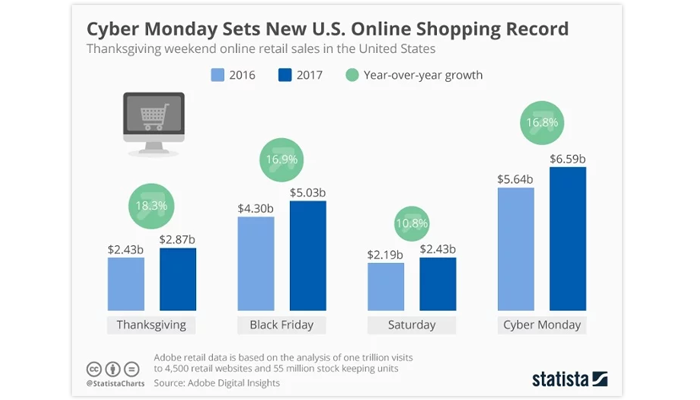 For instance, the above graph states the online shopping record during the Black Friday weekend. When it comes to mobile and web-based applications, the localization factor can play a crucial role. In simple words, localization is a process where developers customize the app effectively in various other languages instead of following the default settings. The option of adding more languages simplifies to the fact that now more people will be able to use the app for their personal use. This further means that it increases accessibility to more foreign countries i.e. global market. The fact that more people will use mobile applications will ultimately lead to a higher number of sales in the app stores i.e. Google Play Store and Apple App Store. If we look at the reports, we can see that 90 percent of the total population is more active on their smartphones rather than on their desktops. And mobile apps are the ones that have the potential to instantly go viral. 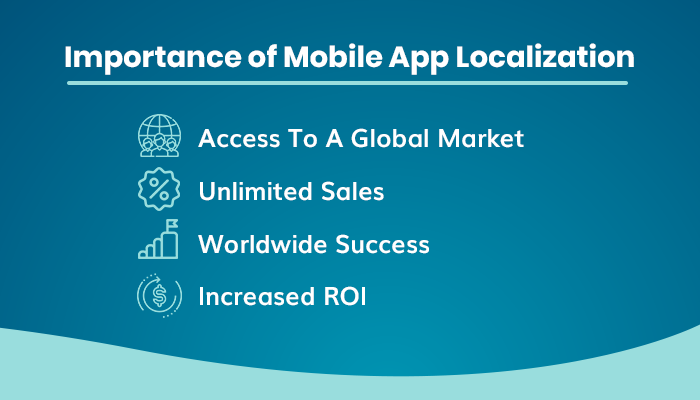 After performing appropriate app localization, it has been reported that companies with localized apps receive more app downloads leading to an increase in their ROI. Also, if you are wondering localization is just about language translation then you are wrong because it is much more than just translating. You can localize your app by adding some modifications to your app, think of it as you are preparing and decorating your app for the upcoming festive season. 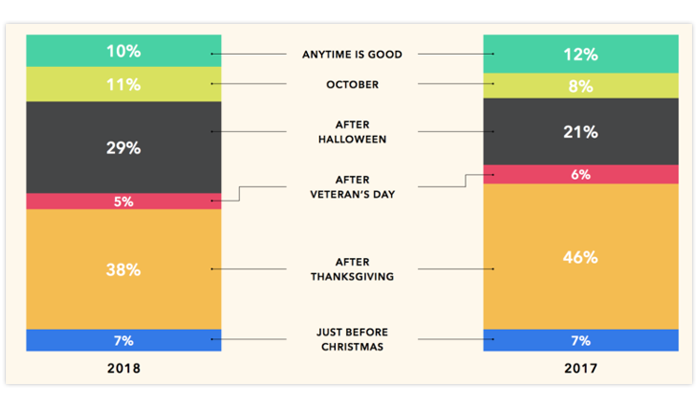 YouAppi asked a total of 533 US-based consumers about when they are ready to see the holiday themes and the above image shows the percentage regarding consumer preferences. The above image shows the example of the Christmas season in the gaming app section. Here ‘Christmas games’, ‘Christmas Games for Girls’ etc are the keywords that are trending. In order to get hold of the latest keywords that are currently in demand for this holiday season, you can directly go to the option of Google Trends. With the help of Google Trends reports you can easily discover keywords that are trending and have the maximum user search. Only use keywords that are frequently being searched. Update app titles as well as the description. Use the keywords in images for more effectiveness. Connect Keyword with special deals/offers. Who is your actual target audience? What do they think about your current app? What would you like them to think about your app? How will you attract them to your digital products/services? Are you targeting a business or consumer user base? What are your competitors' strategies? Answering these questions will provide you with a clear idea about your audience, their preferences, and your competitors' marketing tactics. The entire objective behind targeting audiences wisely is to optimize your budgets and invest them in promotional activities that benefit your app the most. Today, referral campaigns have become a key component in the culture of mobile app development, and the holiday season is the best time to completely utilize them. For example, during the time of Black Friday, Easter, Halloween etc you might have noticed the change in the themes of the app that you usually use. 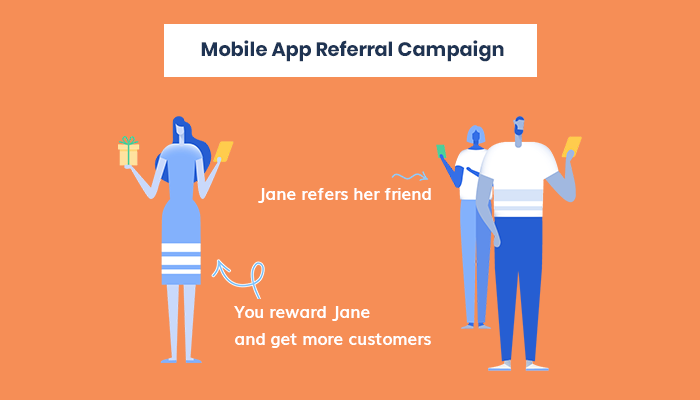 The above image showcases the example of a mobile application referral campaign where one user refers to a particular mobile app to another user. And the latter accepts the request from the app refer then both of the users get rewards from the application. This way you can even include more Brand Ambassadors for your mobile app. These application referral campaigns can be stated as a top-notch holiday app marketing tool which can also be used for driving the mobile user acquisition campaign, as well as boosting the overall audience reach of a mobile or Web app. Bonus Point: The actual cost of acquiring a new user can be really high, but using an effective strategy like app promotion campaigns like referral techniques can optimize the cost with respect to the reward system of the referral campaign. 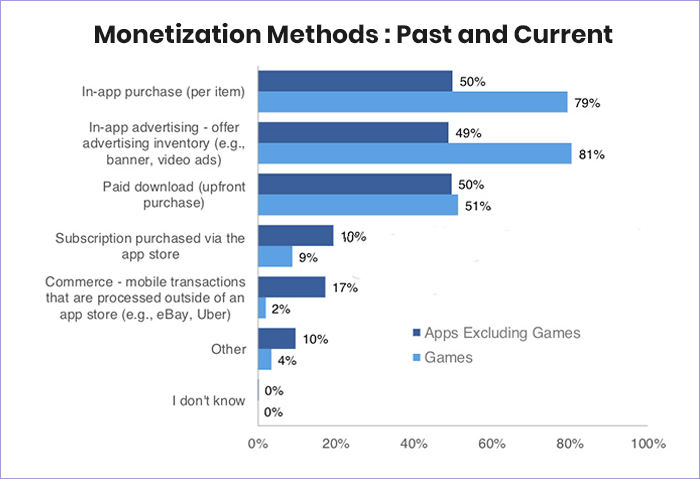 According to a recent worldwide survey by App Annie that was done by app professionals, it was seen that in-app purchases and in-app advertising were two of the most popular app monetization strategies that are currently being used by app owners. Apart from this, many experts even believe that other categories like subscription and mCommerce will be the ones that will gain more popularity over time. You can look at the below graph for more reference. The process of data monetization is related to gathering information, analyzing it and then transferring the information. Once this is complete we then segment the non-personal information of users from the overall data. In the case of app developers, this is a great opportunity to capitalize on the holiday season from mobile app users without any requirement of extra effort. All you need to do is just add SDK (Software Development Kit) to the mobile app and then prepare a user consent form according to it. So, once the user agrees to share their data, you can further transfer it to the data collector. For example: Right now, one of the things that are getting huge attention in the holiday season is the concept of reward videos. This technique can help you in maximizing the app revenue by providing a means to keep the user engaged for a longer period of time. The holiday season is the time during which all businesses are looking forward to increasing their sales. Localization is a process where developers customize the app effectively according to the audience. Apart from language translation, you can also localize your app by modifying its look. Both ASO and SEO practices are crucial for mobile app development. 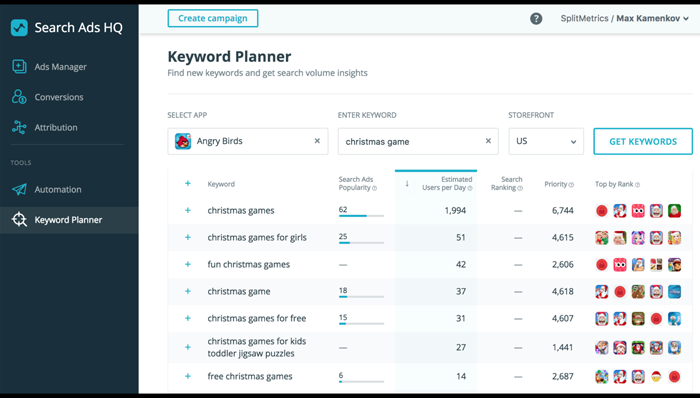 Make sure you also update app titles as well as the description with effective holiday keywords. The objective behind targeting audiences is to optimize your budgets and invest them in the app promotions that benefit your brand the most. Referral campaigns can be stated as a top-notch marketing tool. These ways can be used for driving user acquisition, as well as boosting the overall audience reach of the app. Subscriptions and mCommerce are the main app monetization ways to gain popularity in the upcoming months. So, these were the key takeaways of this article on effective ways that can help you in maximizing your app revenue this Christmas season. Also, if you are interested in reading more such informative articles about mobile app development then feel free to check out some of our previous articles like ‘Mobile App Development Trends That Will Take Over In 2019’ and ‘5 Effective Ways To Maximize Your App Development Budget’. In addition to that, make sure you click on that ‘Subscribe’ button to stay updated with all the latest and trending news straight from the mobile app industry only at MobileAppDaily.